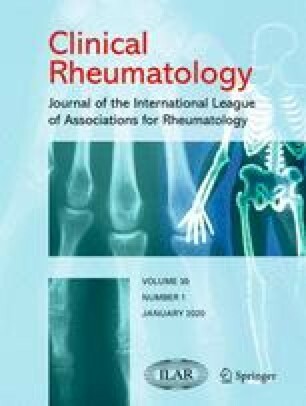 The clinico-laboratory features of 16 patients with dermatomyositis (DM) were compared between patients with accompanying rapidly progressive interstitial lung disease (RP-ILD, n= 7) and those with chronic interstitial lung disease (C-ILD, n= 9), and also between deceased (seven RP-ILD and three C-ILD) and living patients (six C-ILD). The extent of muscle weakness of the extremities and frequency of autoantibody positivity were significantly lower in DM patients with RP-ILD than in DM patients with C-ILD. Furthermore, significantly lower serum ceatine kinase/lactate dehydrogenase levels (0.26 ± 0.27) were found in the 10 patients who died than in the six living patients (1.21 ± 1.09). A higher CD4+/CD8+ T-lymphocyte ratio in the peripheral blood (3.51 ± 2.65) was detected in the four DM patients with RP-ILD who died than in the six living DM patients with C-ILD (1.22 ± 0.49).